bsfiosco has no other items for sale. The Dell Precision M6600 laptop has 8192 MB of RAM and a 750 GB hard drive and comes with an Intel Core processor that has a speed of 2200 MHz. To top off this list of impressive features is a large 17 x 3-inch LCD screen with an LED backlight, displaying vibrant colors and crystal-clear images. 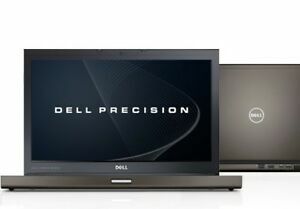 This Dell Precision notebook also features built-in Wi-Fi and DisplayPort, VGA, and HDMI ports, letting you connect this laptop to a television or computer monitor. This computer comes with a preinstalled version of Windows 7, and, as an added bonus, this laptop also features a built-in microphone and webcam. Excellent value. Clear monitor. If you get windows 10, you must go to graphic card makers website to get the new driver for win 10. Dell state that they are not supporting this pooter with win 10. Really nice unit. If you travel with it and use the same unit back at your base, there is a super docking station that lets you grab and go quickly, leaving your peripherals connected to the dock, ready for your quick return. Don't use it much unplugged but battery life seems fine for a unit of this size. Love the 17". Get it! It's really good workstation laptop even though it's dual core it handles SolidWorks 2018 with a solid state drive and 4 gigs of memory well. I will be also working with Photoshop and we'll see how that goes. For the price I cannot complain being that brand-new something like this would probably run at $1000- $2,000. Has it's faults but I would buy another. It's heavy, but as the ad says built like a tank. What I really like is the storage for two hard drives. This is what sold this laptop. One TB in the first drive and 2TB in the second, love it..
Really like the laptop even though it is a bit dated it still allowed me to run windows 7 and upgrade the internal components. That was the goal and that was achieved for a very reasonable cost. The laptop feels really great and solid. Screen is absolutely gorgeous. The power brick is huge. The laptop is upgradable (socketed GPU and CPU), but getting inside of it is really really tough. Took me about 2 hours and 50+ screws of different shapes and sizes to get to the CPU and GPU. The build quality is phenomenal. I had a few problems with scratches on the lid. The laptop was also overheating on idle load and doing fine on full load which was strange. This is due to vents on the bottom which have to have access to air, so I lifted the laptop a bit and the temperatures dropped immediately. The hard drives are very slow but I plan on upgrading to SSD's soon anyways so that is not a big deal. The touchpad is fantastic and very nice to use, and the full keyboard with very nice key travel leads to very few errors and a very pleasant experience. The connectivity of the laptop is wonderful as well, including 4 USB ports (2x2.0 and 2x3.0), a firewire port, an esata port, a VGA port, an hdmi port and an ethernet port. a microphone and headphone jack, a dvd drive and a expresscard slot. Opening it up, we have 2 fans (1 for GPU, 1 for CPU), 2 hard drive slots, a Msata slot and a WWAN slot, as well as the WLAN slot. We also have the above mentioned dvd slot which can be replaced with a blu-ray drive or an extra hard drive with a hard drive caddy. We also have 2 ram slots with 2 more right under the keyboard (the full 4 ram slots can only be used with a quad core CPU) I would like to share my plans for this beauty: I will put in 2x2tb hard drives, 1x500GB Samsung 850 Evo hard drive for boot, 32 Gb of Corsair vengeance DDR3 RAM @ 1600Mhz. I will also upgrade the CPU to an i7 2920xm and the GPU to an AMD HD 7970m. If you plan to buy it, don't expect it to be portable at all, but as long as you know that it is a truly fantastic laptop.